Researched by Paul Martin, the South Carolina Route Log lists all Interstate, U.S., and State Highways in South Carolina. The state slogan Smiling Faces. 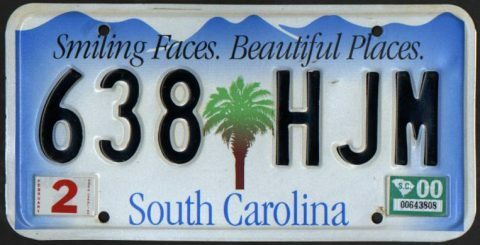 Beautiful Places was incorporated into the new South Carolina license plate in 2000. The Palmetto State redesigned the plate twice since then. An alternate standard tag design available features the state flag and caption In God We Trust. Vanity tags issued in the state feature an alternate background featuring a mountain and seagrass motif, indicative of the state’s diverse geography. Five major interstates serve the state. Interstate 20 joins the capital city with Florence and Interstate 95 to the east and Augusta and Atlanta, Georgia to the west. Interstate 26 joins Charleston and the LowCountry with Columbia and the Greenville/Spartanburg area. Interstate 77 provides a link from Columbia northward to Rock Hill and Charlotte, North Carolina. Interstate 85 straddles the Appalachian Mountain Piedmont as a busy freeway linking Atlanta with Charlotte. Interstate 95 travels north-south along the coastal plain, primarily providing through traffic needs between Florida and the Northeast U.S.
Interstate 73 is a planned route from southern North Carolina near Rockingham eastward into the Myrtle Beach and Grand Strand area. Funding delays, environmental concerns due to wetland impacts, and public support have hampered efforts for new corridor. As such, some portions may be built as a toll road to accelerate construction. Six branch routes serve cities across the Palmetto State. These include Interstate 185, a combination urban spur to Downtown Greenville and tolled loop south of Greenville. Joining I-185 at Greenville is Interstate 385. The lengthy route originates east of Downtown along the Golden Strip Freeway. The freeway circles east and south to Mauldin, where it overtakes U.S. 276 southeast to Simpsonville, Fountain Inn and Clinton where it connects with I-26. Interstate 585 rounds out the Upstate spurs, connecting Business Loop I-85 with Spartanburg alongside U.S. 176 on an older freeway. Further south, Interstate 126 spurs east from I-26 to Downtown Columbia. The 2009 completed extension of I-520 east to I-20 at North Augusta completed the loop south around Augusta, Georgia. The lone branch route in the LowCountry is Interstate 526. The east-west freeway forms a bypass for U.S. 17 and commuter route from I-26 west and east of Charleston. Efforts continue to complete the loop south and east to the James Island Freeway (South Carolina 30). Much of the original network of U.S. routes within the Palmetto state remains in intact. Some exceptions are the truncation of U.S. 276 due to Interstate 385 and the removal of U.S. 29 Alternate near the Spartanburg vicinity due to Interstate 85. Additional realignments include U.S. 17 with I-95 south from Yemassee, U.S. 15 & 301 with I-95 across Lake Marion, and U.S. 76 along the I-126 spur into Columbia. SCDOT also assigns U.S. and State Highway spurs. These routes are generally unsigned, and provide connectivity between intersecting or adjacent routes. 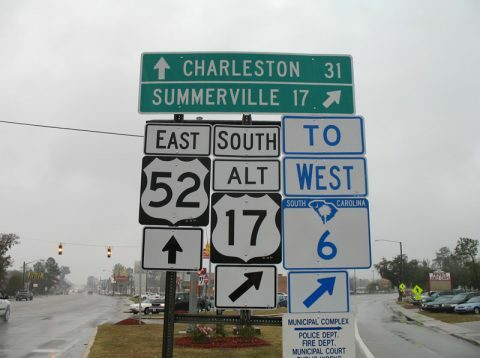 U.S. 52 Spur extends south to the Charleston historic district as an example. U.S. 17A northbound at U.S. 15 and South Carolina 64 Business in Walterboro. U.S. 15 begins a six-state run from here. Photo taken by Paul Martin (2001). South Carolina state highways are not organized in a north-south or east-west scheme. Route clustering is also not used in the state. Three-digit state highways however act as loops and spurs from their implied parent routes. South Carolina 171 for instance refers to U.S. 17 in its numbering, or can be read as South Carolina 17-1. South Carolina 165 technically reads South Carolina 16-5, as it branches from South Carolina 5. This configuration is not unique to South Carolina, as Washington state also follows the practice. Several multi state routes join the South Carolina state highway system, including MSR 72 with Georgia, MSR 28 with Georgia and North Carolina, and MSR 121 south to Florida. Freeway construction at Myrtle Beach designated South Carolina 22 as part of the future Interstate 73 corridor and South Carolina 31 along the Carolina Bays Parkway. Carolina Bays Parkway is the potential “eastern” extent for Interstate 74 from coastal North Carolina. S.C. 31 previously was numbered along the Mark Clark Expressway (now I-526) west of Charleston. S.C. 6 trailblazer at the split of U.S. 17A south and U.S. 52 east at Moncks Corner. South Carolina redesigned the state highway marker in 2007. Debuting then was a design featuring the palmetto tree and crescent moon, symbols from the South Carolina state flag. New signs were grandfathered in throughout the state, initially with the replacement of damaged or missing signs. Much in the way Interstate 26 is today, this highway was South Carolina’s “Main Street” in the 1920s and 1930s. Connecting Greenville, Columbia, and Charleston, it was over 200 miles long at one point. It became multiplexed with newer US Federal highway designations (namely U.S. 76, U.S. 176, and U.S. 178) until being phased out everywhere but in the city of Cayce in the 1940s. South Carolina 22, the “Veteran’s Memorial Highway,” is planned to become part of the Interstate 73 corridor, provided that the section between Candor, North Carolina, and Aynor, South Carolina, is constructed. It was financed from a combination of funds derived from the South Carolina Infrastructure Bank and accommodation taxes collected in the Grand Strand area. South Carolina 28 (Savannah River Scenic Highway) forms a multi state route with Georgia 28 when it criss-crosses the Savannah River into Rabun County and Augusta/Richmond County. It also becomes North Carolina 28 when crossing the Georgia-North Carolina line. Continued from Beech Island to Beaufort until replaced in sections by U.S. 278 and U.S. 21. South Carolina 30 will become Interstate 526 if the proposed 6.8-mile extension is complete from Folly Road (South Carolina 171) to Savannah Highway (U.S. 17). South Carolina 31 was designated along the western seven miles of the Mark Clark Expresssway from 1984-1989 between Interstate 26 and U.S. 17 in Charleston. Upon completion of the eastern leg of the freeway, from I-26 to U.S. 17 north of Mt. Pleasant in 1990, the designation was removed and the entire length renumbered Interstate 526. South Carolina 31 was designated again along the Carolina Bays Parkway. The parkway will eventually extend to connect with U.S. 17 near Pawley’s Island, providing an Interstate-grade freeway bypass of almost the entire Grand Strand area. Route 49 continues an additional 179 miles through NC and 78 miles through VA before ending with a junction of U.S. 360, 7NW Crewe, VA.
South Carolina 65 and the easternmost 1.2 miles of South Carolina 9 from the U.S. 17 interchange at the Intracoastal Waterway bridge was designated as South Carolina 69 from 1972 until around 1980. South Carolina 72 becomes Georgia 72 at the state line. The western terminus is located at U.S. 29/GA 8 just outside of Athens in Madison County (GA-72 is also a GRIP corridor and a common GA/SC National Highway System (NHS) route). Also known as Myrtle Beach’s famous “Ocean Boulevard”. SC 80 was a 3.5 (roughly) mile 4-lane highway called the “J. Verne Smith Parkway”. that was later extended another 2.1 miles to SC 14. 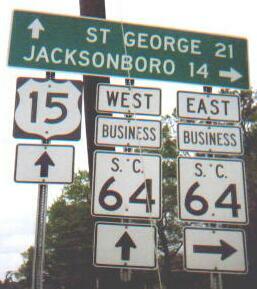 S.C. 121 becomes GA 121 when it crosses into Georgia in Augusta. Ultimately, GA 121 connects to Florida 121. Despite its multi-state route, it never was, nor has it been planned as part of a “U.S. 121.” Instead U.S. 121 is the designation for the Coalfields Expressway corridor in Virginia and West Virginia. (Historical note: U.S. 121 was an original US highway designation from 1926-1933, extending from Lexington, NC to Wytheville, VA. It was superseded with U.S. 52 in 1934). 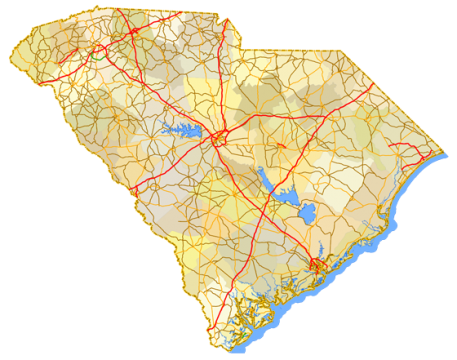 SC DOT purchased right-of-way and planned on an extension connecting S.C. 277 with Interstate 126 in the the 1970’s. Due to neighborhood opposition, this plan was delayed and finally cancelled in the early 1980’s. The right-of-way was returned (“leased for $1”) to the city of Columbia in 2001. SCDOT however still reserved the right to complete the highway on the original right-of-way, should it be needed in the future. This highway was never designated as designated Interstate 277.